I’ve got great news that is great news only to me: cleaning up my work area this afternoon, I found an index card I’d long thought lost. The card had appeared in a book (I don’t remember which book) I’d bought at a yard sale or a library book sale or in a used book store. On the index card was taped a passage cut from a photocopied page of something—a newspaper story, a magazine article, an academic paper; something. 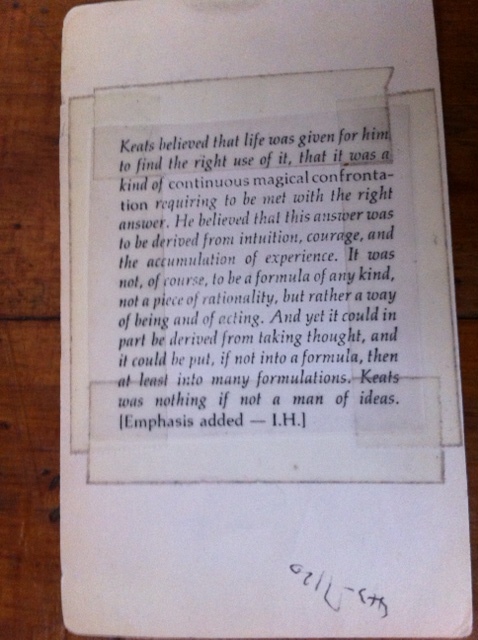 It was a note on the life of the poet John Keats. He’s one of those poets I’m sure I read in AP English, but don’t remember particularly, and so having an index card fall into my lap that told of his view on life did not at first mean much to me beyond the distinct small thrill of encountering something left by a previous reader of this book. But the more I read the passage, the more wonderful it seemed. I thought it would make for a great blog item, something others might enjoy, and then I lost it. I hadn’t memorized the text, and so I couldn’t really Google it. And here I’ve found the passage online. It’s from Lionel Trilling and the Critics: Opposing Selves, edited by John Rodden, and the passage is from a Lionel Trilling essay on Keats. The “I.H.” who adds emphasis in this passage is Irving Howe, in a New Republic piece “On Lionel Trilling: ‘Continuous Magical Confrontation,'” published in 1976. What to say, really, about the content of the passage? You don’t need to know or like Keats, I don’t think, to find something beautiful and inspiring in Trilling’s description of how Keats lived his life. Anyway, that’s my story. I’ll be putting the card somewhere safe this time.